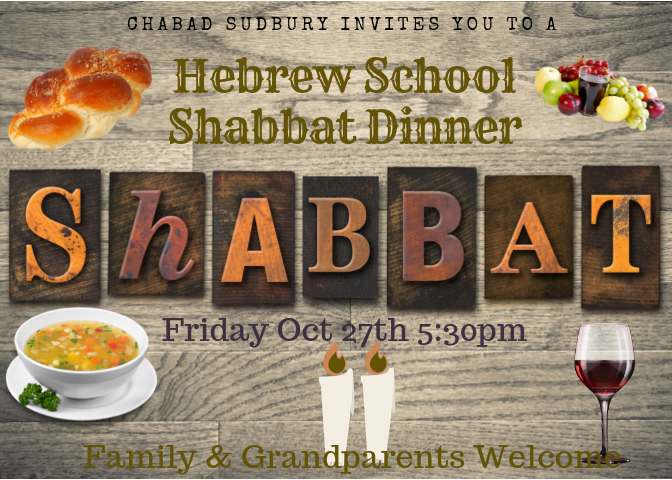 Chabad of Sudbury invites all of its Hebrew School Students and their parents, siblings and grandparents to join us for a Hebrew School Shabbat Dinner and an evening of song, great food, socializing, games and Shabbat fun. If you haven't yet RSVP'd please let us know by email at info@chabadsudbury.com or by calling 978-443-0110. If you would like to volunteer and help prepare, cook or setup, please let us know.